The four Galilean satellites Io, Europa, Ganymede, and Callisto, shown next to Jupiter's Great Red Spot to give perspective. The Galilean moons are the four satellites of Jupiter discovered on date of discovery::January 7, 1610 by discoverer::Galileo Galilei. They were the first natural satellites of any planet other than Earth to be discovered and are in fact the only four known dwarf planet sized satellites that Jupiter has. Galileo Galilei observed Jupiter beginning on January 7, 1610, with his famous telescope. He at first thought he had discovered three stars near Jupiter, but on the next night those "stars" seemed to have moved. He continued to observe Jupiter and its companion "stars" for seven days, during which time a fourth "star" (actually Ganymede) appeared and all four of these objects appeared to move with Jupiter. Finally he concluded that these objects were not stars at all, but satellites of Jupiter. This was the first direct observation that provided evidence for Nicolaus Copernicus's heliocentric model of the solar system. discoverer::Simon Marius claimed to observe Jupiter and these satellites independently of Galileo and beginning five weeks earlier. However, he did not publish his findings, while Galileo published his. Furthermore, Galileo's notes were more reliable and extensive than those of Marius, which is why Ganymede and the three other satellites he observed (Io, Europa, and Callisto) are called the Galilean satellites and not the Galilean-Marian satellites. Marius does, however, receive credit for providing the names that the satellites have today. He named Ganymede, the largest, for the mythical son of King Tros of Troy, carried aloft to Mount Olympus by Zeus to be the cupbearer to the gods. (The names Zeus and Jupiter refer to the same classical deity from whom Jupiter gets its name.) The other three satellites are named for three of Zeus' most famous mistresses. Marius propounded these names after Johannes Kepler suggested them to him. Galileo, for his part, called them the "Medicean planets" after the Medici family whose patronage he was actively seeking at the time. He did so on the advice of the Grand Duke of Tuscany, whom he had tutored in mathematics as a boy. Rather than assign the moons individual names, Galileo simply numbered the moons I, II, III, and IV and prefaced each Roman numeral by the name of Jupiter. The satellites carried these names for two centuries. At that time, the technology of telescopes had improved tremendously, so that telescopes could now detect objects much smaller than these four moons. The discovery of other moons of Jupiter made the simple naming system untenably confusing. Only then did the Keplerian/Marian names come into common usage. According to the most currently popular models of this resonance, Ganymede's orbit should not be as eccentric as it now is. Others have suggested that an asteroidal or cometary impact has produced this eccentricity, but Showman and Malhotra, in 1997, showed that such an impact cannot account for the observed eccentricity. The resonance is held responsible for the relatively pronounced eccentricity of the innermost satellite, Io--and also for the tremendous tidal reshaping that Io undergoes during its less-than-two-day month. Most scientist hold that the latter phenomenon heats Io and causes its remarkable volcanism. The origin of the resonance itself is controversial. 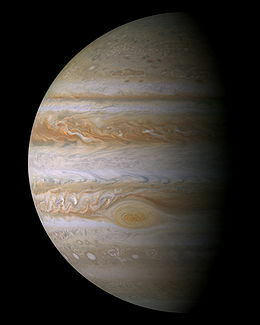 Peale and Lee, in 2002, presented a model suggesting that this resonance is primordial and thus was part of the Jovian system since its formation. Their model, however, derives from the nebular hypothesis of the formation of the solar system and thus depends on uniformitarian assumptions. Showman and Malhotra suggest a model by which the resonance developed after the solar system had formed. The recently completed Galileo Project has returned a wealth of data that has allowed planetary scientists to refine greatly their models of the interiors of the Galilean moons. Their best conjectures of those interior structures are shown at the left. 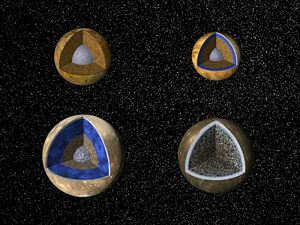 Except for Callisto, all the moons appear to have metallic (iron, nickel) cores. Again, except for Callisto, all the cores are surrounded by rock shells. 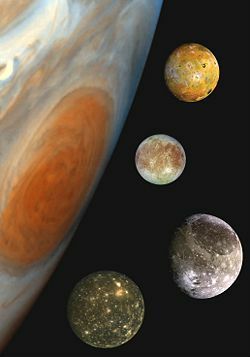 Io's rock or silicate shell extends to the surface, while the rock layers of Ganymede and Europa are in turn surrounded by shells of water in ice or liquid form. Callisto is shown as a relatively uniform mixture of comparable amounts of ice and rock. Recent data, however, suggests that Callisto's substance is 60% rock and 40% water ice, with greater proportions of rock as one goes deeper. The surface layers of Ganymede and Callisto differ markedly from the underlying ice/rock layers in a variety of ways, including the portion of rock they contain and definitely the relative relief of the surfaces. Ganymede has very high relief while Callisto has very low relief and looks flat by comparison. Europa's surface is one of brittle ice overlying either another, much thicker ice layer or a liquid water ocean. Galileo's recent flyby data, including magnetometer measurements, suggest that a liquid water ocean might now underlie a relatively thin surface ice/rock layer. The thinness of the surface was the key fact that informed the decision to crash Galileo into Jupiter rather than risk an unplanned crash landing on Europa. Much of the preceding is taken from the original caption to the image shown, written by JPL/NASA staff, but revised in light of additional data received subsequent to the composition of this image. Io, Europa, and Ganymede all definitely possess their own internal magnetic fields. 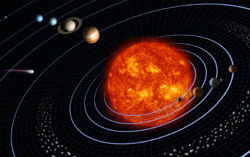 But because they lie well within Jupiter's magnetosphere, most of the magnetic fluxes are induced by Jupiter's field interacting with either the conductive core of Io or the conductive shells (possible subsurface oceans) of Europa and Ganymede. Ganymede's field is strong enough to define its own magnetosphere inside that of Jupiter. Callisto's magnetic fluxes are very weak, and its internal magnetic field is probably undetectable. Callisto has a weak induced magnetic field, though it lies outside Jupiter's magnetosphere. Io is the innermost, the most dense, and in many other ways the most remarkable of the Galilean moons. Since the Voyager 1 and Voyager 2 flybys in 1979 and 1980, Io has been known to be volcanically active--the most active body in all the solar system. Tidal heating is the most popular theory to explain this activity, but even that cannot account completely for the total amount of heat that flows out from Io at all times. Europa, the second innermost, is also the smallest of the Galileans. It has very few craters, and thus by uniformitarian criteria it is considered "young." The brittle ice sheet that overlays it has fueled speculation as to whether a much thicker ice sheet, or a liquid-water ocean, lies deep to it. 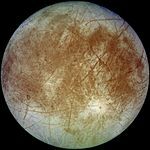 This in turn has fueled speculation, both in the scientific community and in science fiction, as to whether Europa harbors life. The Galileo spacecraft developed evidence in favor of the proposition that Europa has a sub-crust saltwater ocean under a very thin rock-and-ice layer. In order to prevent the spacecraft from crashing into Europa, rupturing the crust, and contaminating Europa's oceans with earthly microbes, Galileo's mission controllers steered Galileo into a crash dive into Jupiter in September of 2003. However, the exploration of Europa with a submersible probe, to be delivered by an ice-penetrating missile, is under active consideration. Ganymede is the largest moon not only of Jupiter but in all the solar system--larger than Mercury so that in theory it could be a true planet if it orbited the Sun. In sharp contrast to Io and Europa, Ganymede is very heavily cratered and is therefore considered "old." Ganymede has its own independent magnetic field, and a quite strong one. Like Europa, it has a saltwater ocean, but under a much thicker crust than that of Europa. Callisto, the outermost of the Galilean moons, does not participate in the Laplace resonance with the other three and also lies beyond the Van Allen-like radiation belt that surrounds Jupiter. Like Ganymede, Callisto is very heavily cratered. The three-part orbital resonance of Io, Europa, and Ganymede becomes very difficult to explain in light of Ganymede appearing to be so much "older" than Io or Europa. At least some astronomers believe that this resonance is primordial. Not all astronomers agree. But if the resonance is primordial, then the presence within it of bodies of differing "geological ages" begs explanation. Most observers consider that Io is older than it looks, because the volcanoes and their associated lava flows have erased the craters. But that cannot apply to Europa, which looks at least as "young" as does Io. Io's volcanism testifies to its tremendous internal heat. In fact, Io is radiating far more heat than tidal heating alone could generate. And yet no astronomer accepts radioactive decay as a significant source of Io's heat. Either Io has another, still-unknown source of heat, or else the present rate of heat outflow is unsustainable and temporary. ↑ 1.0 1.1 1.2 "The Discovery of the Galilean Satellites," JPL, NASA, n.d. Quoted by Hamilton, Calvin J., SolarViews. Accessed February 18, 2008. ↑ 2.0 2.1 2.2 Showman, Adam P., and Malhotra, Renu. "Tidal Evolution into the Laplace Resonance and the Resurfacing of Ganymede." Icarus, 127:93-111, 1997. Accessed February 18, 2008. ↑ 3.0 3.1 Peale, S. J., and Lee, Man Hoi. "A Primordial Origin of the Laplace Relation Among the Galilean Satellites." Science, 298(5593):593-597, October 2002. Accessed February 18, 2008. ↑ 4.0 4.1 "Galileo Crashes into Jupiter." ABC News Online, Australian Broadcasting Company, September 21, 2003. Accessed February 20, 2008. ↑ 5.0 5.1 Macey, Richard. "Galileo's death leap onto Jupiter." Sydney Morning Herald Online, September 15, 2003. Accessed February 20, 2008. ↑ "Catalog page for Image PIA01082," NASA/JPL Photojournal. Accessed February 29, 2008. This page was last modified on 8 February 2009, at 14:59.